Stannard and Dixon Lith 7 Poland St.
Only two families lived at Broadwater for the hundred years or so after it was built in the early 1840s, firstly George Marshall and his descendants and then Edward G. Price, his wife and one of his daughters. Broadwater's story began in 1836 when James More Molyneux, esq., disposed both of the estate and manor of Cattshall to "George Marshall, esq. By the purchase of an adjoining farm, this gentleman became the possessor of nearly the whole tithing". By 1844 he was also "the owner of Broadwater and several farms in Godalming parish ; as well as of many houses in and around the town. Both a court-leet and a court-baron are attached to this manor" [of Cattshall]. George Marshall was a prosperous local timber merchant, and in 1841 his family were living on Bridge Street but had moved into the newly built Broadwater by 1844. Business was clearly booming as Mr. Marshall secured an "extensive contract" to supply English elm to six large English dockyards in 1849.. His newly acquired land was also being used for cricket matches as the same year a match between Brighton and Godalming was played at Broadwater; the local team included members of the Marshall, Napper and Caesar families. The Marshalls were "well known staunch patrons of the game of cricket, not only in their own county but universally so". 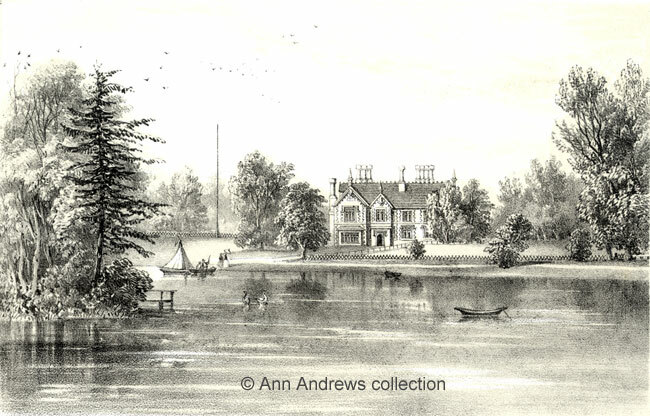 "BROADWATER, co. Surrey, is the beautifully situated residence, not far from Godalming, of George Marshall, Esq., son of the late Robert Marshall, Esq., and descendant of an old Sussex family ; settled in that county for many generations and transplanted about the middle of the 18th century to Surrey, by Thomas (son of Thomas Marshall of Easebourne) who m. Mary, only daughter of William Bryant of Haslemere." George passed away at Broadwater on Christmas Eve 1853, aged 65. His widow, Sarah, continued to live at the property until her death on 10 Mar 1874, although she died at The Cottage, Munstead Heath. The couple and their children had been supported by a number of servants but possibly the most loyal was Emily Smith who was with them from some time before 1841 until Sarah's death; she went on to become the housekeeper at the Manor House further along the road. Their eldest surviving son, Murray, took over the business. Like the other males in the Marshall family he enjoyed cricket. Although Murray, his wife and children lived on Bridge Street, he was "of Broadwater", something also used by other Marshall family members. Before he died it was said that "the hospitalities of Broadwater House have been famous". In 1861 Murray was identified as a "Timber Merchant Farmer 800 Acres 30 Men 10 Boys". Unfortunately, he was to endure a long and painful illness and passed away at Broadwater House, still his mother's home, on 15 Jan 1870. The following year's census showed his estate was even larger as his widow, Eliza, was a Timber Merchant employing 60 men & 10 boys and farmer of 1200 acres employing 30 labourers and 18 boys". Of their three eldest sons George managed the timber business, Bryant managed the farming side whilst Murray Wyatt was studying law. George and Sarah's younger sons Alexander, Frederick and Henry joined the Army. Of the three, Frederick Marshall, the second youngest, also lived at Broadwater and was the most famous; he had been christened at Godalming on 23 Sep 1829 and educated at "Eaton". He served in the Crimea and during the Zulu war of 1879 he was in command of the Cavalry Brigade, then in command of the advanced posts on the lines of communication. He became a Companion of the Order of St Michael and St George in 1887 and K.C.M.G. in 1897 "Fred" was once the "beau ideal" of a heavy cavalry officer, standing six feet seven in his stockings. He often played crocket [sic] with the All England Eleven at his "charming private ground attached to his pretty house on the outskirts of Godalming" and was said to be much liked and greatly respected". He died at 9 Eaton Place Middlesex in 1900 and was buried at Brookwood Cemetery, Woking. In the first decade of the twentieth century Murray's eldest son, George Marshall, was still associated with Broadwater although it is unclear if he lived at the house. His son Henry was awarded the Military Cross in 1915 and was said to have been badly gassed. A closer view of the house. feature in the landscape, is one of the most delightful spots in the county of Surrey." By 1913 George Edward Price, a wealthy Canadian timber merchant, was established at Broadwater; the Victorian mansion was said to have 23 rooms. Belgian Refugees were given shelter here during the first World War. Skating took place on Broadwater lake during spells of intensely cold weather, when the lake froze; in February 1929 the main gates had to be locked to exclude motorists, who, it was alleged, had damaged the turf two years before. Mr. Price was chairman of Price and Pierce, Ltd and a director of Price Brothers & Co.; he died in London, aged 78, in March 1932. The following year someone broke into Broadwater and stole money from his daughter Dorothy. Sister Rodgers, who was nursing Miss Price's mother at the time, even saw a figure move in the dressing room and thought it was one of the servants! However, there were tell-tale footprints in a flower bed under the billiards room window, which had been open. A few days later a witness saw the thief at his home elsewhere in the town, and took him to Godalming police station where the miscreant was charged. Presumably the footprints matched. Mrs. Henrietta Keane Price died on 27 Nov 1935 aged 83 and her executors lost little time in placing Broadwater on the market. In February 1936 the auctioneers Messrs. H. B. Baverstock and Son (Godalming) sold Broadwater, the house and 150 acres and £37,000 of real property. Dorothy Price needed a new home. She moved first to Bramley and later to Milford where she died in 1957. The house, parkland, lake, and farm buildings, has been bought by Mr. W. Hoptroff, a Godalming builder, who wanted to develop part or whole of the property for housing. The purchase included both the Cricket Club Ground and the tennis courts. Afterwards Mr. Hoptroff informed the Council of his purchase, with the idea they might wish to purchase what they wanted and use it for public open spaces or recreation grounds, but they decided not to take up the offer at that time. In November the same year the Mayor of Godalming Alderman P. C. Fletcher and his wife (the Mayoress) made an incredibly generous gift to Godalming. They provided the £1060 to purchase the 4½ acres of Broadwater Cricket Ground and and gave it to the town. The couple were celebrating 25 years of marriage and it also seemed an appropriate thing to do in the Coronation year. Alderman Fletcher, a cousin of the Charterhouse headmaster Frank, hoped it was something that would be enjoyed for many years to come. Early the following year Alderman Fletcher publicly thanked Mr. Hoptroff for allowing the grounds to be used for the coronation festivities. The house was still standing, and in use, in 1957 when cartons of clothing given to aid Hungarian refugees and stored at Broadwater House were ransacked. "The large property, owned by the Corporation, had recently been used as a repository", The W.V.S. had sorted and baled 5,000 garments to be dispatched, some intended for a camp at Hydon Heath. One room was left knee deep in clothing. It seems a sad event for an attractive building nearing the end of its life. In 1947 negotiations had begun on a 21-acre site, on part of the Broadwater estate, to house Meadrow Secondary School and provide education for 600 pupils. Building work began in 1953 and it was hoped to get the first block of the new Broadwater Secondary School opened the following September although both the Meadrow and Broadwater sites would have to be used for some time. 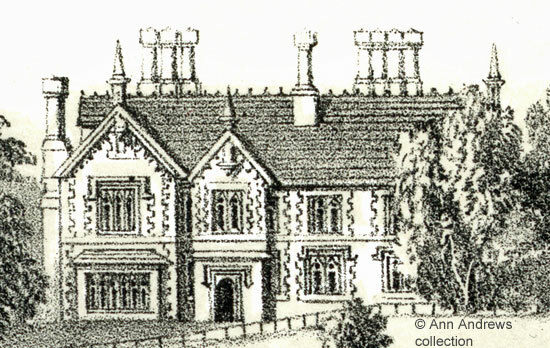 Broadwater House remained on Ordnance Survey maps until the early 1960s, sited close to the rugby club boundary. A garden wall of Broadwater House is still standing today, on the boundary with the club. Lithograph of "Broadwater, Co. Surrey" by Augustus Butler, printed by Stannard & Dixon. Published in "A visitation of the seats and arms of the noblemen and gentlemen of Great Britain" by John Bernard Burke Esq. Published by Colburn & Co., 13 Great Marlborough Street. Lithograph in the collection of, provided by and © Ann Andrews. Quotations from "A Topographical History of Surrey", Edward Wedlake Brayley & John Britton (1844). The Geological Section by Gideon Mantell, L.L. D. F.R.S., etc. The Illustrative Department under the superintendence of Thomas Allom, M. I. B. A. Published Dorking by Robert Best Ede and London by David Bogue, Fleet Street. Extracted from the 1841 census. Broadwater had not been built. George Marshall had married Sarah Alexander on 1 Feb 1820 at Edenbridge, KEN by Licence. The groom was described as of Godalming and a bachelor. "The Royal Cornwall Gazette, Falmouth Packet, and General Advertiser" (Truro), Thursday, 31 Aug, 1849. Quotation from Burke (see above). "Reading Mercury", 31 Dec 1853. Report of his death. He was buried at Godalming Parish Church on 31 Dec 1853, aged 65, and his abode was given as Broadwater. The Will of George Marshall, Timber Merchant of Godalming, Surrey is held by The National Archives, Kew (PROB 11/2186/48). Dated: 3 Feb 1854. She can be found in Kelly's 1855 Directory (as Mrs. S. Marshall, Broad water, under gentry), Kelly's 1867 Directory (as Mrs. S Marshall, Broad water) and the PO 1867 Directory, (as Mrs. Marshall, Broadwater) as well as the census returns for 1861 and 1871. Her will was proved on 9 May 1874; she left a sizable estate. See the details of the Wills and freehold estate of both George and Sarah Marshall at the Surrey History Centre. I have found seven children for George and Sarah. In addition to those mentioned above there was George (b. 22 Mar 1822, c. 18 Jul 1822, bu. at SS. Peter & Paul 4 Dec 1826), Sarah (c.1825) and Emily (c.1828). In the 1881 census she was 67 and had been born at Midhurst, Sussex. Murray was christened at Godalming on 31 Oct 1823. He married Eliza Gibbs at West Itchenor in Sussex on 8 Feb 1849. In Kelly's 1855 Directory his entry was: Murray Marshall, timber merchant, ship & barge owner, The Wharf, Bridge street & at Pageant's Wharf, Rotherhithe, London. His death was reported in the "Surrey Advertiser"of 22 Jan 1870 and he was buried at Busbridge Church on 21 Jan 1870. Despite his will saying he was "of Broadwater" his abode was simply given as Godalming. The family lived at The Bridge, a large house next to the river by the Town Bridge. Extracted from the 1871 census. Eliza's brother, Wyatt Gibbs, was a solicitor and living with them at the time. "Surrey Mirror", 15 June 1900. Report of his death. His entry in the PO Directory of 1878 was Major-General Frederick Marshall, J.P., Broadwater (under Farncombe) and in the PO Directory of 1891 was Lieut.-General Frederick Marshall, C.M.G., J.P., Broadwater (under Farncombe). He was mentioned in military records, including Harts Army List of 1888. In 1895 General Marshall described as a tenant for life of the Broadwater Estate. "Rhyl Record and Advertiser", 16 June 1900. His burial was reported in the "London Evening Standard" on 13 June 1900. He was survived by his wife Adelaide Laura, who died in 1916. Murray's son George, who was born in 1851, was a Steward of Forestry at several Agricultural shows before the First World War. (George Marshall, Broadwater, Godalming). He died on 19 Feb 1921 at the Bridge Godalming but his probate details show he was "of Broadwater". His wife Edith (nee Hull) had passed away on 4 Feb 1913 at 6 Seymour Street, London. Her father was the late George James Hull of Westbrook. "Surrey Advertiser", 31 July 1915. Kelly's 1913 Directory. In the 1911 census Eliza Wade, a 70 year old servant was at Broadwater. The Price family were at their London home - 1, Craven Hill, Paddington. One of their servants was Guildford born, so it seems probable they were already dividing their time between London and Broadwater. "Surrey Advertiser", 22 February 1915. "Surrey Advertiser", 16 February 1929. Mr. Price's death was reported in "The Times" of 10 Mar 1932. "West Sussex Gazette",7 Sept 1933. Mistook thief for Butler. "The Times", 8 Feb 1936 (report of her estate). "West Sussex Gazette," 13 February 1936 and "The Times", 25 March 1936 (report of sale of Broadwater House). She was shown in the 1939 Register, available on FindMyPast, at Bramley . Probate records record her last address. "West Sussex Gazette",7 May 1936. Broadwater Estate Decision. "Memories of Farncombe and Godalming" (1981), The Godalming Trust. The gift was reported in the "West Sussex Gazette", 12 November 1936. "West Sussex Gazette", 14 January 1937. "West Sussex Gazette", 21 February 1957. Refugees' Clothing Stolen. "West Sussex Gazette", 16 January 1947. Broadwater County Mixed School, Godalming. "West Sussex Gazette", 19 November 1953. Broadwater School Progress. With thanks to Pam Talbot of the Godalming Trust for alerting me to this information. Further information can be found on the Historic England web site. They refer to Broadwater House as Broadwater Hall, but there are no references found to date of it having been called that.